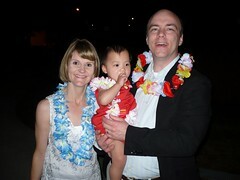 Addison went on her first road trip to Panama City Beach, Florida last Thursday for her daddy's annual meeting. She had a wonderful time! She loved the pool and just being outdoors. On Friday night, there was a dinner where she ate all of my shrimp and not much of her kid's dinner which consisted of chicken fingers and fries. Afterwards, they served dessert and had dancing under the veranda. We have a real party animal! She danced the night away with mom and dad. Well... until 8:30, that's late for a 20 month old right? On Saturday, we enjoyed visiting the duck pond and walking out on the pier and watching the fish jump. We met some friends for dinner on Saturday night where Addison enjoyed broiled crab claws and more shrimp! We headed back on Sunday so we could prepare for another week. Click here to see more pics.